DRINC produces three base alcohols that we begin for crafting the final vodka, flavored vodka, liqueurs, and other spirit classes and types. Each one uses a unique raw material and consequently, using the same equipment, the same talent, and the same technology, does produce a different and unique flavor. The Uber-Tuber® is an Idaho russet potato alcohol that takes over nine pounds of whole fresh potatoes to make one 80 proof, 750ml vodka bottle and the original foundation for the company. 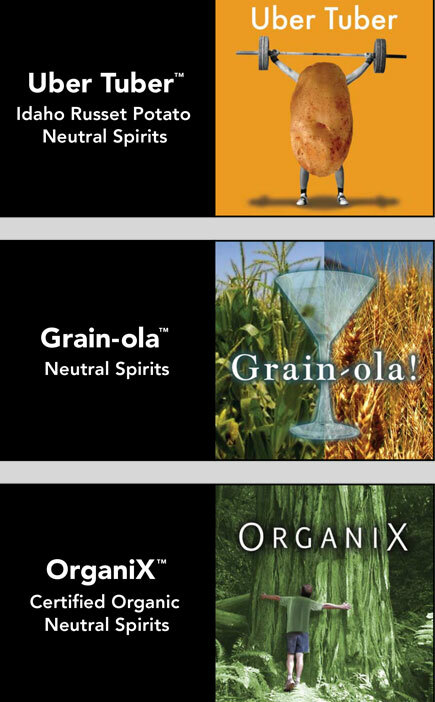 Grain-ola® is the newest addition to the trio of unique alcohols which is made from Idaho winter wheat. OrgnaniX® is an Idaho certified organic grain alcohol that was started in 2001 when DRINC first started organic spirits production. Each spirit has a different cost, flavor, and marketability for our clients to choose from as a blank canvas to build their product from and yet all spirits have been award winning in our branding partner’s products.